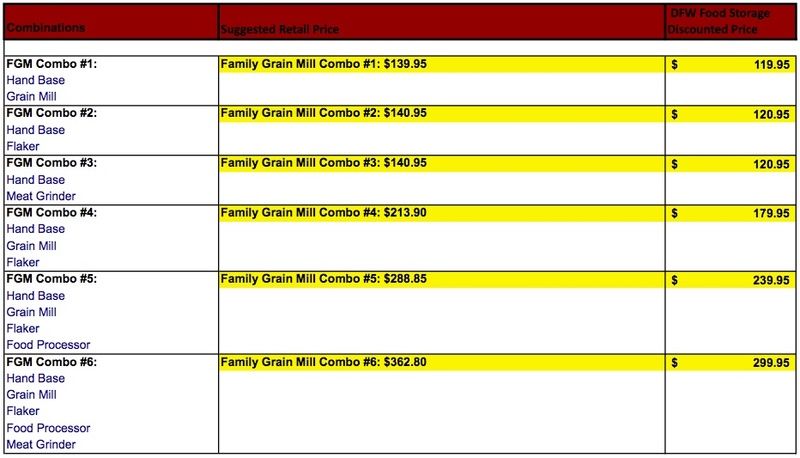 We are taking orders for Family Grain Mills... So Easy A Kid Can Do It!!! • Versatile Multi-Grain milling: The grind is infinitely adjustable, from fine for bread flour, to medium for "Cream Of Wheat" style cereals, or coarse for steel cut or cracked grain (if you want to, you can adjust it to such a coarse setting that grains aren't even cracked.) The milling head grinds wheat, oats, corn, soybeans, rye, barley, rice, spelt, flax, buckwheat, millet, coffee, kamut, quinoa, and sesame (doesn't grind popcorn.) It will also mill some chopped, dry, non-oily herbs and spices. The Family Grain Mill grinds cool to preserve nutrients. Large 5 cup hopper capacity. 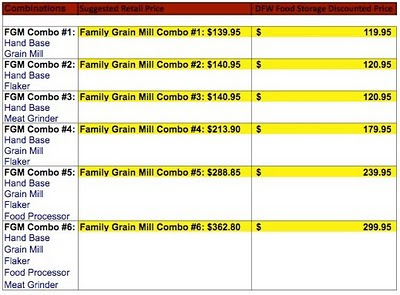 • Additional Functions: Available options for the Family Grain Mill are listed in the table below. They include the Food Processor which slices and shreds vegetables, nuts, fruits and cheese with 3 included stainless steel drums. The Flaker Mill head flakes soft grains and is popular for fresh homemade oatmeal, making a hearty flake from oat groats (oats with the hulls removed) that's thicker and chewier than store-bought flaked oats. The Food & Meat Grinder is available with a variety of disk sizes. • Quality Construction: Manufactured in Germany by Messerschmidt, the Family Grain Mill is built with high carbon steel and the same super-tough material that football helmets and industrial safety shields are made of. It's a durable grain mill capable of a lifetime of dependable use. • Fast & Easy to Use: One cup of fine flour is produced in just 2 minutes in hand operation, or a minute and a half with the 150 watt electric motor base. (It takes about 2/3 cup of wheat to make a cup of fine flour.) Because it doesn't grind with friction, the FGM's hand operated base turns easily, much easier than most hand operated mills. Overall time/effort is four times less than required by most hand mills — and most mills still won't produce as fine a flour. Hopper has generous 5 cup capacity. • Fast Cleanup & Dust-Free Operation: Family Grain Mill components remove quickly for cleaning. The grain mill head disassembles completely in five seconds, so it's quick and easy to have your mill ready for its next use. And where many mills create a cloud of flour dust to settle everywhere, the FGM operates dust-free. 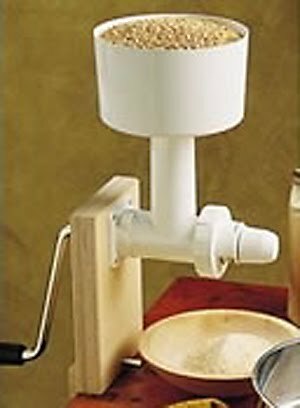 • A Quiet Grain Mill: The Family Grain Mill will be very easy on your ears. • Easy Setup, Compact Storage: The Family Grain Mill motor base is free-standing in use, while the hand base clamps quickly and securely onto a table or counter edge, without marring. Small or large bowls will fit under the mill head to collect flour. 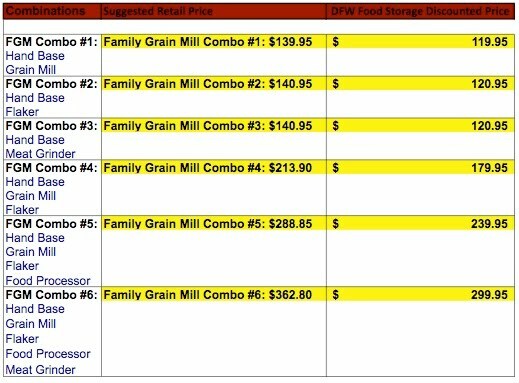 Modular design of the Family Grain Mill stores compactly. • Mills: Wheat flour, corn meal flour, oat flour, rye flour, barley flour, rice flour, spelt flour, flax flour, buckwheat flour, millet flour, coffee, kamut flour, sesame, and more. Also cracks grain to any size -- you can set the adjustment dial to any size from flour or meal to cereal grind or cracked grain. • Warranty: Manufacturer's lifetime warranty (excluding replaceable burrs). THANK YOU ... for all of your palm shortening orders. We are hoping to have them available for pick up next Friday the 18th. We will keep you updated through email. If you are attending the Square Foot Gardening class and would like to pick up your order then, email us.